How do people, things, and (ritual or devotional) spaces relate to the Elsewhere, and how are they in turn shaped by the Elsewhere in their everyday doings and being? What is our conceptual understanding of the Elsewhere and how can it be researched? How do affective politics and political aesthetics constitute the mutual relationship between the Elsewhere and religious actors’ everyday existence? 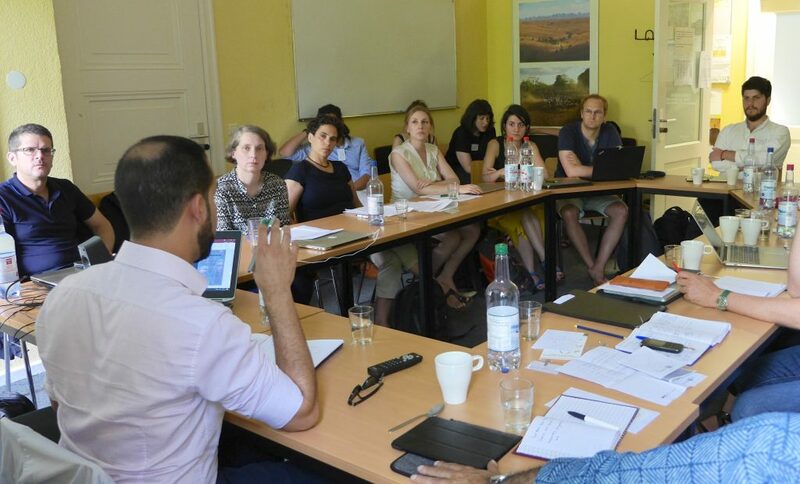 These were some of the questions taking center stage in the workshop “Engaging the Elsewhere – Affective politics and political aesthetics across Muslim and Christian life-worlds” at Freie Universität Berlin (FUB) on June 1st, 2018. The day-long workshop was jointly organized by the Collaborative Research Centre Affective Societies’ project C03 “Embodied Emotions and Affective Belonging in Migratory Contexts: Sufi Orders and Neo-Pentecostal Churches in Berlin” (Omar Kasmani, Dominik Mattes, Hansjörg Dilger) and the FUB Institute of Social and Cultural Anthropology (Nasima Selim). With the participation of more than 20 doctoral and postdoctoral scholars from social and cultural anthropology, Islamic studies, history, and political science, the workshop presented a multi-perspectival view of how the concept of “the Elsewhere” can fruitfully be employed in various research contexts stretching across a variety of geographical settings and religious communities, e.g. Sufi and Shia Muslims, Pentecostal and Catholic Christians. Three research projects set in Germany focused on the mobilization of affects in a West African neo-Pentecostal church in Berlin, the materiality of mosques in urban Germany, and queer readings of Zikr rituals in Berlin. Other projects concentrated on the affective-sensory dimensions of tranced suffering among Sufis in Algeria, Shi’i mourning processions in Northeastern Anatolia, and the dynamics of de-vernacularization with regard to Shi’i ritual practices and cultural productions. Presentations also dealt with the Elsewhere in the contexts of moral economies of mobile alms–seekers in Moscow; interactions with spirits and the divine in Ghana; healing processions of Catholic pilgrims in Lourdes; and debates around the question of Islamic truth by Ahmadiyya groups in Gambia. With their joint public keynote on May 31st, Amira Mittermaier (University of Toronto) and Annalisa Butticci (Utrecht University) had introduced the workshop participants to their understandings of the politics of the Elsewhere and the aesthetics of presence respectively, giving insights into their own research about dream stories among Sufi Muslims in Cairo and sensorially rich religious practices of African Pentecostals in Italy. Both scholars emphasized the political implications of affective dynamics that may unfold in the presence of the divine or in dream-visions and addressed questions of agency. In the discussion following the keynote, Amira Mittermeier and Annalisa Butticci advised against tapping in what they coined the “Christian trap”, i.e. taking Christian imageries of the Elsewhere as a point of departure or even as a benchmark and thereby neglecting other standpoints. The two scholars also led the discussions the next day and commented on each of the presentations that spoke in particular to the following topics. 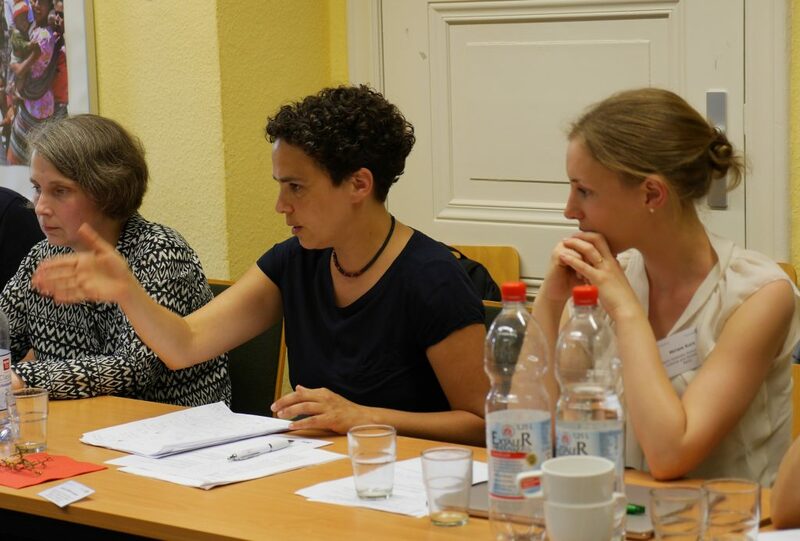 On the one hand, the workshop participants discussed intensively how the Elsewhere could be grasped both in the specific local context of their research as well as in stating its utility as a meta-analytical concept across different disciplines. Thereby, interlocutors’ conceptualizations of Elsewhere differed widely across various research sites: Is the Elsewhere understood temporally, as moving inward or as moving beyond? Is it really elsewhere or also present in the here and now? What are we moving away from when oriented towards an Elsewhere, i.e. what is its counterpart in Christians’ and Muslims’ everyday lives? In which ways does it exclude other spatialities or realms? The attending scholars critically examined the consequences of choosing a material, ontological or relational approach to engaging specific manifestations of Elsewhere: What does a particular understanding of the notion foreclose or open up? Is it possible to think Elsewhere beyond questions of the divine and exceeding contexts of the religious? Could it be extended to studies of migration and mobility? On the other hand, there was a widely shared agreement in the workshop discussions that conceptualizing Elsewhere too broadly runs the risk of watering down the concept to the point of becoming an empty term or a mere synonym for the invisible. Thus, there was common ground in defining Elsewhere predominantly in relation to the religious or in the ways in which it involved powers beyond the visible and tangible, thus lending it an enigmatic and at the same time elusive capacity to effect lives and affect people. Participants further saw a considerable potential in the notion’s distinct spatial connotation and suggested to further look into its materiality. They also found it worthwhile to point to the temporal entanglements of Elsewhere, for example how it effects and shapes people’s experiences and conceptualizations of time. Beyond theoretical discussions, what mattered most to the participants was how Elsewhere is invoked by interlocutors in their own, historically situated life-worlds. Yet, the question how a phenomenon is researched that is at best invisible, intangible and often impossible to experience for the researcher herself, is a challenging one. Participants discussed intensively what research strategies might be conducive for an understanding of their interlocutors’ relationship with the Elsewhere, and thus how creatively to engage the phenomenon under study in their research. Participant observation has its own limits and in certain contexts taboos might prevent people from being able to speak about intimate experiences. Moreover, for many interlocutors it may not be possible to adequately describe and talk about relations with other beings and realms, for instance when it comes to the way they are affected by dreams, spirits, and other possibly malicious ‘supernatural’ powers. The experiences of research partners were therefore approached from multiple perspectives also taking into account the affective, sonic, aesthetic, embodied and ritual dimensions that relations with the Elsewhere entail. An overarching topic that recurred in the workshop discussions relates to the politics of representation and research ethics when approaching the Elsewhere in one’s field site: What topics are researchers drawn to and how do they position themselves in relation to matters of belief or religious practice? How does this positionality differ from or converge with their interlocutors’ understandings of, and relationships with, the Elsewhere? How can ethnographers bridge the dilemma of doing justice to their interlocutors’ particular perspectives while following their own research interests? One way of dealing with different standpoints of researchers and the researched considered in the workshop was transparency. This means that researchers should make an attempt to explain to both their interlocutors and their audiences why they frame their research questions and outcomes in certain ways. This may help prevent misunderstandings and open up a shared space to collaboratively explore how various meanings and positions in relation to religious matters overlap or diverge from another. Questions of the political, aesthetic, and affective dimensions of Elsewhere were elicited in various presentations during the workshop. In the closing discussion, participants emphasized the usefulness of a comparative perspective when context, specificity and internal diversity in the exploration of Christian and Muslim (and potentially other religious) life-worlds are considered at the same time. 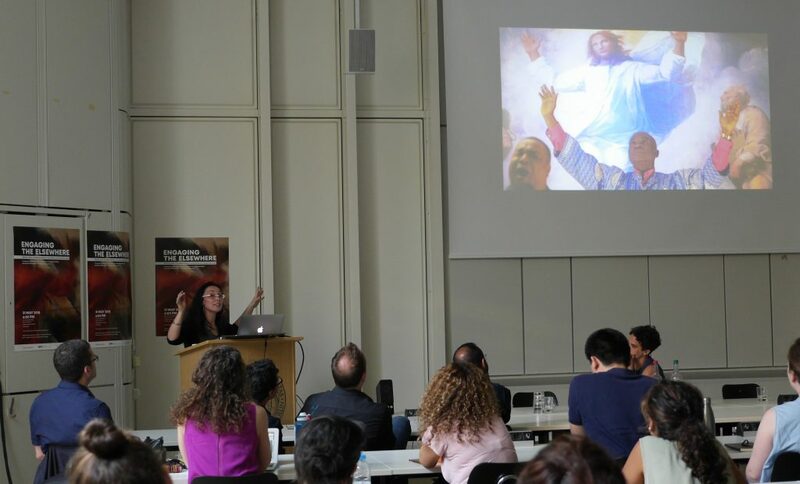 Annalisa Butticci stressed how looking for commonalities in the everyday lives of Muslims and Christians and their engagements with the Elsewhere may raise questions of the existential, shared aspects of human experience. The emphasis on affective states or intensities producing and requiring engagements with notions of Elsewhere and the simultaneous impact that a powerful Elsewhere exerts on people’s lives, encourages further research on how affects are orchestrated, nuanced and modulated within specific social and political settings. Similarly, the largely and hitherto underdeveloped gendered dimension of engaging Elsewhere would be an important research endeavor as would be the diversities of Elsewhere(s) which may be defined both by their spatial and temporal dimensions as well as their partly benevolent, but often also destructive qualities. (English) Irina Engelmann is a student assistant in the CRC Affective Societies Project "Embodied Emotions and Affective Belonging in Migratory Contexts".